Gre'thor is the Klingon equivalent to the Terran "Hell", or to be more precise, the greek "Hades". It is where the souls of the dishonored go when they die after being ferried there on the Barge of the Dead in the waters inhabited by Kos'karii. The insignia of Gre'thor, and dishonored Klingons, is an inverted emblem of the Empire. 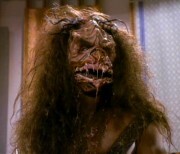 In Klingon mythology, the gates of Gre'thor are guarded by the monster figure known as Fek'lhr. If you've come expecting to find a Star Trek fan page, or a bunch of Klingon stuff, you've come to the wrong place. Yes, I'm a Star-Trek fan. Who isn't? However I'm not a fanatic about it! (Isn't that a contradiction? Fan is short for Fanatic... but I digress). There will not be any thing fancy here, just a place for me to play a bit and try different things. There will be some content based on some of my hobbies. You may find stuff on this page that doesn't work. I'm probably trying something new or different and either still trying to make it work, or broke it with something else I did elsewhere. Have a look around, if you see something you like, let me know. or posted with permission of the copyright holder. This page utilizes HTML5/CSS3 and may not render properly with non-compliant browsers.